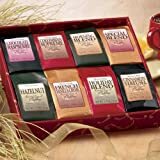 It's hard to know what to give to a woman for Valentine's, so you, like many others, may resort to the usual suspects: flowers, chocolate, coffee, and maybe jewelry. The good thing about these is that women appreciate these types of gifts, no matter how many times they have received them for Valentine's Day in the past. However, you can add some thought and variety into the love feast day by accompanying your gifts with a well-chosen card. There are many on Zazzle to choose from. Zazzle is a print-on-demand online store where you can choose designs posted by others or make your own cards and other types of products. Also, if you choose an existing design, you can customize it by changing the text a little, if you want to, adding extra images or removing some image elements, etc. 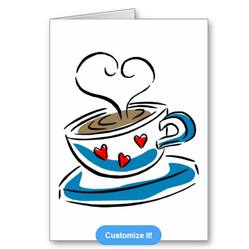 Of course, you can also personalize the cards by adding the recipient's name, if you so wish. This is a folded card which you can customize on all four sides. 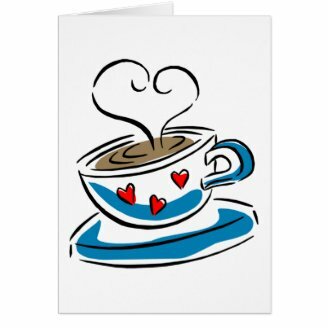 The existing design has a steaming-hot cup of coffee with steam that shapes a heart on the first cover, and the text "Happy Valentines Day" inside. You may want to play with the text a bit, express more personal feelings, and so on. You can also add "Dear [Recipient's Name]" if you want to. It should take less than a minute or two to customize it on the Zazzle Web site, provided you know the text you want to include. You can give your Valentine's date a set of matching lovers mugs. Zazzle has many designs. I'm showing one of them below; feel free to click on the image and search for others on Zazzle. Some of them are plain His/Hers mugs, others are cute, with love birds, owls, flowers, hearts, and photos in hearts, and yet others include some humor, such as those saying "Mr. Right" and "Mrs. Always Right" (and showing as well a mustache and lips). I'm showing the latter below. Now, if you give your date one of these mugs, you may want to keep the theme of lovers mugs on the Valentine's card as well. I'm showing below one of such cards. 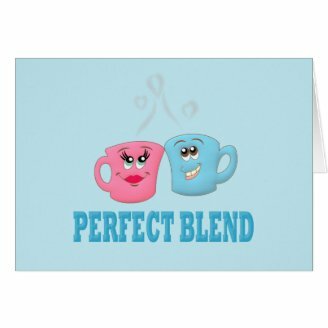 Coffee invites, of course, certain metaphors, and perfect blend is one of them. The one I'm showing has a playful design. It has no text inside, so be sure to think of something, whether typed online or written by hand. If you want to surprise her and send the card beforehand by mail, you can get customizable perfect blend stamps with your initials. Keep in mind though that if you do decide to buy the stamps, you have to get a sheet of 20. I don't see why starting a tradition of sending her little cards and notes in the mail with this message wouldn't work. In fact, I see it as a rather good idea if you feel the need to declare your love this way (through messages in the old-fashioned mail). This one is a postcard, but you can transfer the design on a greeting card once you're on this product's page. If you look carefully, you will see in the drawing the silhouettes of a man and a woman. This card will certainly appeal to some couples. You can send it to your partner before Valentine's Day or before your wedding anniversary, or whatever other anniversary you celebrate. You can keep the design as is, or you can remove the top and bottom edges. Remember you can type something inside easily and nicely. Also note that Zazzle has many nice fonts to play with. 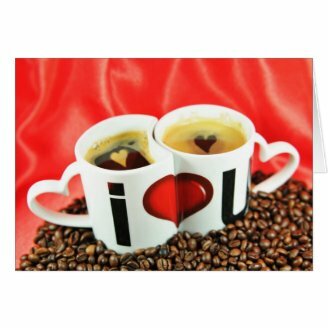 Finally, one of the most popular Valentine's sayings for coffee lovers, "I love you more than coffee." I'm showing one design, which is also available in blue. It's a folded card, and it has no text inside. It's a 5" x 7" greeting card, but you can make it a 4" x 5.6" note card or a big 8.5" x 11" greeting card. If you're a coffee lover or a coffee addict, you may enjoy this message. It's a rather old idea, but still works for people, judging by how popular these designs are on Zazzle. NB: Other designs leave out the bit with "and that says a lot," and you may also enjoy their graphics more, so be sure to search on Z. for the perfect card for you. 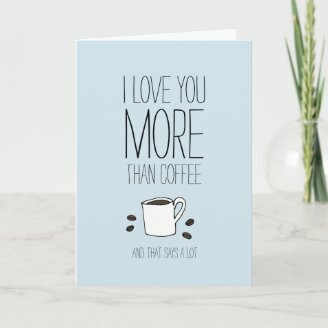 I hope I've given you some ideas for Valentine's Day cards for your coffee-loving date. If these designs don't do it for you, remember that there are many more Valentine's-themed cards on Z. to choose from. If you haven't bought the coffee yet, and you're considering flavored coffee, here's one suggestion. 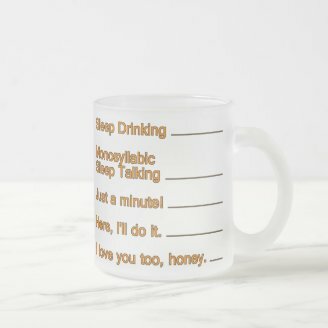 and others, such as the "Don't talk to me yet"-style coffee mug below, which includes imagined morning dialogue between two parents of small kids: "Sleep Drinking. Monosyllabic Sleep Talking. Just a minute! Here, I'll do it. I love you too, honey." I am not a coffee person, but this selection definitely opens a wide variety of options to bring a smile to Mrs. Always Right;) It's only a couple of weeks to next Valentine. How time flies! Mira, The paired mugs and the coffee quote "Coffee..so I can find my mind" are so enchanting! Thank you for all the ideas and options! P.S. What kind of coffee do you favor? Thank you, Shraddha! I, too, think that there cards and mugs for coffee lovers can be great fun on many occasions, as you say. For a coffee love, these are perfect gifts. Valentine's Day or not - they look gorgeous on all occasions. 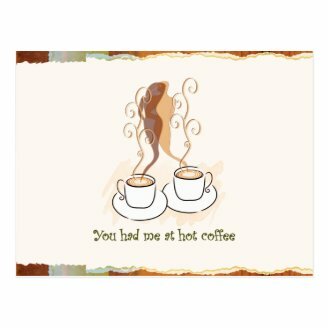 I appreciate a good cup of java and these are all such cute cards. If you have friends and family who like to travel, here are some Christmas gift ideas.